Mana Tiaki — KIA ORANA! Mana Tiaki is one of the three core values of Kia Orana. Tiaki means keeper or guardian and Mana translates as influence or power. It means guardianship with a sacred purpose, to preserve it for future generations. The keeper has the power or ability to keep our culture and heritage alive. Mana Tiaki also refers to our responsibility as guardians of these islands and environment. Round 11 of the Vaka Pride (VP) Competition was held from November 2018 to February 2019. For this particular round the VP committee judged communities on a number of different areas during their two days of judging (26th and 27th of February). The focus areas for VP and their respective judging categories are as follows; public sports grounds and in particular recycling stations with these points going towards the Akono i te Ao Rangi category. Te Are Manu animal shelter, and Vaimaanga Community Watch, along with visits to all community cyclone shelters, were another focal area for the Committee. These organisations were nominated by members of the public for prizes in the Tupuranga Tangata category. Finally, historical sites which have been a regular feature of Vaka Pride, saw points allocated towards the Peu Maori category. The prize giving for this round was held on Saturday the 16th of March at the Rarotonga Bowling Club to coincide with the first day of the Golden Ukalele Festival. Public sports grounds were added as a special category in the Akono i te Ao Rangi category with the judging focusing on recycling systems at the sports fields as well as the general upkeep and maintenance. Tupuranga Tangata category judges villages on their community efforts to address issues of crime, dogs and other pests, and all other safety related issues in their communities. Cyclone shelters were a first time inclusion to the Vaka Pride competition with judging on general maintenance and upkeep of the shelter. Judging also looked at the accessibility and safety of the cyclone shelters for the community. Peu Maori category judges villages on their efforts to maintain the overall tidiness of historical sites and surrounding areas. The Vaka Pride (VP) committee started their round island inspections for round 11 of the competition on Tuesday the 26th of February. It was a successful first day of judging with beautiful weather to accompany their site visits which included the village sports grounds, Te Are Manu animal shelter and the Vaiimaanga Community Watch group. Judging for the village sports grounds focused on the general maintenance and upkeep of the area, and in particular the recycling stations or recycling system in place. Points here go towards prizes in the Akono I Te Ao Rangi category for VP. The experience was an eye opening one for new committee member Celine Dyer from the Office of the Prime Minister Climate Change division. “Generally the villages are doing well with their sports grounds, whereas other villages needed to improve especially in the area of recycling and waste” said Dyer. The VP committee also visited two community initiatives that are addressing issues impacting the community and the Tourism Industry. Te Are Manu animal shelter in Arorangi, and the Vaimaanga Community Watch group. These two community based organisations address issues within the Tupuranga Tangata category of the VP competition, which focuses on the stray dogs and crime. The ongoing voluntary efforts showcased in these community groups supports the work of several of the agencies on the VP committee. The visits were a good opportunity to network and share ideas with multiple stakeholders at the same time. The VP representative from the Cook Islands Police department, Teau Rakei said, “everyone needs to work together to address the increasing crime rate and stray dog issue if we are to see any changes” while commending both organisations for the good work that they are doing in the community. Meitaki maata to the community groups that do a fantastic job in maintaining our sports grounds for all to use. Also, Meitaki maata to Te Are Manu and Vaimaanga Community Watch volunteers who took the time to meet with the VP committee on the day and who do an amazing job for our community. The Vaka Pride competition celebrates ten successful rounds since its launch in 2015. For this particular round from July – October 2018, the Vaka Pride committee focused on Public toilets and historical sites for the Peu Maori section. The Vaka Pride judging was held over two days on the 22nd and 23rd of October where the Vaka Pride committee inspected 13 public toilets and 6 historical sites around the island, along with general inspections of the villages on Rarotonga. The winners for this round of the Vaka Pride were announced during the Titikaveka College Island Night on the 1st of December. The Vaka Pride committee along with Cook Islands Tourism Corporation would like to extend a big meitaki maata and a massive congratulations to all the participants and winners for another successful round of the Vaka Pride competition. Akono i te Ao Rangi category focuses on most clean public areas helping to keep our islands pollution free and disease free. These prizes are awarded to the village with the most points collected from the Ministry of Internal Affairs (INTAFF) monthly Tama Oire clean up results, Ministry of Health Tutaka results, and the National Environment Service (NES) compliance report. The villages of Avatiu and Matavera had high scores in their monthly clean up reports with INTAFF, particularly the village of Avatiu who scored extremely well with their extra cleaning efforts under their special projects. Both villages had relatively low complaints recorded in these areas through the NES compliance reports. Their winning funds will go towards a community project to assist with the maintenance and upkeep of their respective villages. Tupuranga Tangata category judges villages on their community efforts to address issues of crime, dogs and other pests, and all other safety related issues in their communities. First place: Teau Rakei - $1,000 Teau Rakei was nominated by the Vaka Pride committee to receive the award for $1,000 for her continuous efforts with the Puaikura communities to reduce the crime rate. The crime rate in Puaikura has dropped significantly in the last six months according to the Crime Stats report. This has been a direct result of the policing efforts by Teau Rakei. Since her appointment to constable for the Puaikura district she has personally visited the homes of repeat offenders to speak with their families, and has included the Aronga Mana of the village in her efforts. Furthermore, she has initiated and been an advocate for the Puaikura community watch group which aims to alleviate the crime within Vaka Puaikura including the careless and drink driving issue. Peu Maori category judges villages on their efforts to maintain the overall tidiness of their villages and surrounding areas. This round of the Vaka Pride competition focused on, public toilets and historical sites which are both important areas for visitors to our little paradise. The Vaka Pride committee visited thirteen public toilets and six historical sites around Rarotonga in October. The public toilets were judged based on cleanliness of their interior & exterior facilities and their appliances. The toilet at the auditorium had received top scores for all three categories making them come out on top. The toilet at Avana wharf next to The Mooring Café and the Are Tapaeanga at the Western Marina at Avatiu wharf followed closely behind also scoring relatively well in all three categories. Well done to the organisations who continue to maintain these public facilities which are frequently used by our visitors, but also by the general public. The historical sites were judged on maintenance and historical significance. During the Vaka Pride judging day, Paula Paniani met with the Vaka Pride committee to explain the amount of work that had gone into the restoration site of the Nikao cemetery and shared a wealth of information providing the historical context of the cemetery. The journey of the site to full restoration shows the hard work, passion and commitment to this project deserving a first placing from the Vaka Pride committee. The Ngati Arera Burial grounds is a similar restoration site of significance in Avarua. Over the past four months, the Ngati Arera family have been undertaking restoration work at the burial grounds, which was overgrown and still holds many graves which have crumbled apart. The family hope to restore all the remaining graves and document the history of the cemetery through signage, so that the public may be able to learn more about the the piece of land and the families buried there. The third placing went to Te Makirau Marae which has undergone a major makeover since the investiture of Morea Pokokeu Antonia Rangatira in September of this year. The Vaka Pride committee are pleased that the funding won for this section of the Vaka Pride prize giving will go towards the gathering of information and maintenance of these historical sites. The Te Vaka O Ru (TVOR) competition on the island of Aitutaki has been ongoing for over two years now and is similar to the Vaka Pride competition on Rarotonga. Similar to the Vaka Pride competition the decisions for the three judging categories are made by the TVOR committee who is made up of representatives from Internal Affairs, Ministry of Health, Aitutaki Conservation Trust, National Environment Services and the Police department. On Wednesday the 19th of September the TVOR committee conducted their quarterly judging around Aitutaki. The committee was extremely impressed with the level of engagement from the Aitutaki communities for this round of the competition. The village of Vaipeka registered their interest for this round of TVOR for the first time and they focused on clearing the area from the main road leading to their beach. The Vaipae fishing club have clearly been active in maintaining their wharf area by using pass winning funds to install lighting poles, BBQ tables and a water tap for fishing boats. The collaboration from the Vaipae community has been exceptional as they have also been working on replanting trees such as coconut trees. Arutanga village was commended on their ongoing efforts in ensuring their sports fields and wharfage is always clean and replanting around the field. 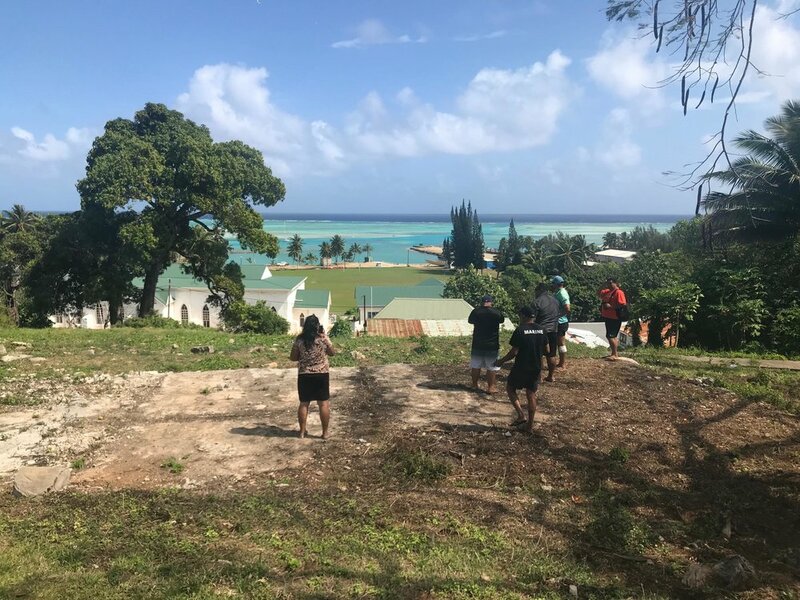 A new project for the Arutanga community is the clearing of vacant land that overlooks the harbour with a prime view overlooking the CICC Church and Arutanga harbour. The plan is to beautify this lookout area and hope to be able to utilise as a scenic lookout point for visitors and locals. The TVOR committee awarded the Akono i te Ao Rangi prize money to the value of $2500 to the Aitutaki Conservation Trust as they have been proactive with ensuring that recycle bins are stationed in areas required, be it for sports or leisure activities. The funding will be used towards a Clean Aitutaki Officer to help to maintain the compost toilets stationed at Ootu beach and Base 1, as well as maintaining recycle bins around the island. The Tupuranga Tangata award of $1250 has been awarded to Arutanga Village as they have been proactive within their village. There has been focus within this village on working with the youth to steer them from getting into trouble and establishing cleaning groups. The Peu Maori category was awarded petrol vouchers to the value of $350 to three deserving individuals for their efforts to beautify and maintain public access way and consideration of traffic when working on the road. Congratulations to Repaio Kiria, Tutai Anitonia and Thomas Hewett for their hard work and efforts that contribute towards the Te Vaka O Ru competition. A special bonus prize for our Mana Tiaki champion was awarded to Papa George Henry who continuously cleans Ootu beach area from the inland to the shorelines. George Henry takes home a $250 voucher from Aquila for his extra efforts into maintaining this public area. Ootu beach is the main launching place of the lagoon cruises in Aitutaki. The prize giving for TVOR was on Saturday the 7th of April 2018 and all winners were announced and acknowledged on live broadcast with Aitutaki radio station. Well done to the people on the beautiful island of Aitutaki who participated in their village clean up. The next round for TVOR is already underway with judging scheduled to take place at the end of June. So, keep up the good work Araura Enua! Cook Islands Tourism Corporation were proud to launch a similar programme to the Vaka Pride competition on Rarotonga and Te Vaka O Ru competition on Aitutaki in Mauke called Te Ieie o te Orau. Te Ieie O te Orau is a similar community programme to Vaka Pride and Te Vaka O Ru, where we can reward communities for going above and beyond to make their homes presentable for all visitors. Although the competition has been formatted to the context of each island, the overall judging remains the same with general tidiness in public areas and beatification efforts being the underlying themes. For all three islands the judging rounds occur every four months, which means three times a year, communities can win cash prizes to go towards their small projects in the villages. The launch of the competition on the island of Mauke was successful with the community groups really getting involved, and their efforts evident around the island on judging day. The village of Ngatiarua took out the top prize of $1,000, followed by the village of Kimiangatau with a prize of $800, and then Areroa Makatea taking out third placing and winning $500. The funds are to go into further beautification projects for the island of Mauke. A great amount of work has gone into this community project and Cook Islands Tourism Corporation would like to thank all those involved for their contributions to the success of the newly established Te Ieie O te Orau competition.